1 foil stamped area on Side 1 of uncoated 100lb Deep Black Linen stock. Spine attachment in matching stock. 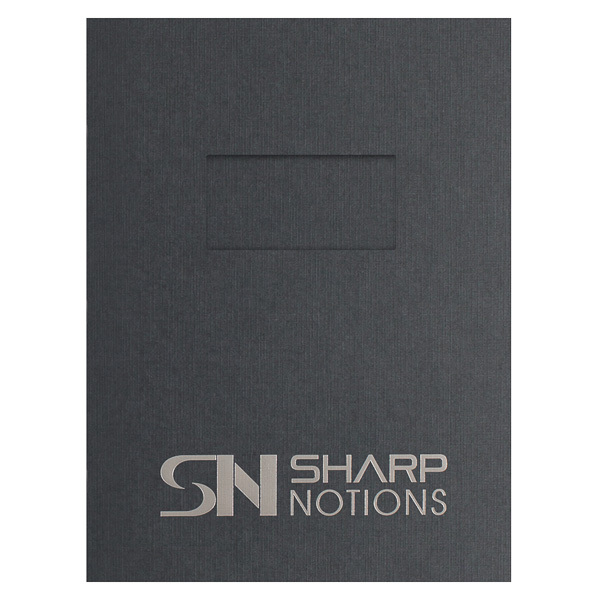 Black panels promote poise and authority—perfect for an experienced marketing agency like Sharp Notions. The stock's linen pattern adds a luxurious texture to suggest quality. Stamped in Metallic Platinum foil, the shiny logo reflects light for a playful element that creates movement, while its sleek feel balances the slightly rough linen stock. A spine attachment ensures that papers stay safely in place on the pocket-less panels. Four-color process printed on Side 1 of 12pt C1S White Semi-Gloss stock coated with Aqueous Satin. 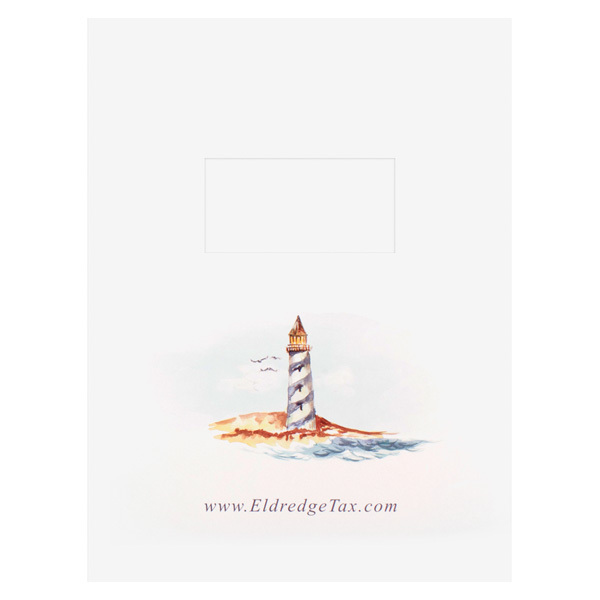 Eldredge Tax's folder features a serene lighthouse scene on its cover. The company's web address is also featured on the cover so clients can easily contact them. One continuous piece wraps around reports, tax returns, and other 8 1/2" x 11" documents for maximum protection. Papers can remain loose between the covers, or you can secure them with staples or a spine attachment. A 4" x 2" die-cut window gives recipients a glimpse of the report. Design a custom title page for a professional, put-together look. You can even create a new title page for each client, making the product reusable across projects.